As I age, it becomes increasingly clear that self-love is the single best way to weather the seasons and thrive. Over the years I’ve struggled with depression, weight and some health issues. What I have witnessed in myself is that I am infinitely more resilient, compassionate and composed when I love myself. Loving oneself is a psychological, physical and mental restorative with far-reaching implications. Here are two fun, restorative and loving practices that I’ve adopted this year. After watching Food Matters, a brilliant documentary about eating healthy food, I started drinking water every morning. (Find it on http://www.foodmatters.tv/ or check Netflix.) I’ve started a new practice of drinking several glasses of water each day before eating or drinking anything else. At first it was somewhat painful to get the water in. I wasn’t used to the clear liquid in my mouth or the filling sensation of that second glass. Now, I can’t get enough. I’ve even starting getting up earlier just to have time to drink it leisurely. After a week, I feel small transformations in my health. It has the unintended consequence of leading to mindfulness about what follows into my body throughout the day. 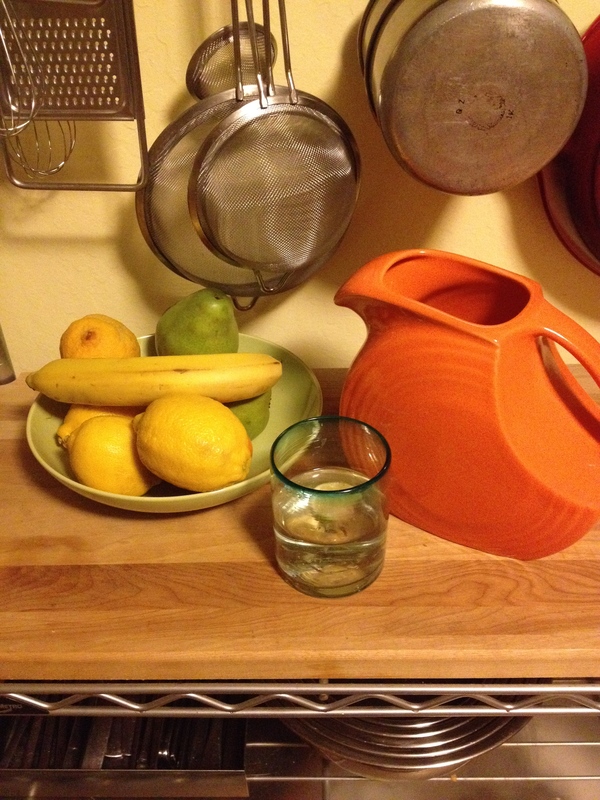 I generally drink more water all day, and have taken a lovely ceramic pitcher out of storage and keep it full of fresh lemon water. My skin is glowing. I know this is love. Like many women, I struggle with self-image at times. I hear the voices in my head and compare myself to someone in a magazine. We are taught to be dissatisfied with the women we are. Our bodies, our skin and our hair are constantly found wanting. If it’s brown we want it blond; straight must go curly, and always someone else has a better figure. The list goes on. Well, I’ve just stopped criticizing myself. It seems that’s the only way to stop the negative energy from consuming my thoughts. Instead of running that old track, I’ve changed tunes and now sing the “I’m-so-grateful-for-my-beautiful-hair-skin-and-body” track. It’s working. The seeds we water are the ones that grow strong and healthy. When we reinforce positive messages about ourselves, they are mirrored back from our friends and community. Self-love is mental. If these seem like simple baby steps, they are. That’s the point. Every little move we make to embrace ourselves is one that can nurture us from within. Some days I even think the good thoughts about myself while I drink the water. In the end, as the adage goes, we are what we eat. Every single thing we put into ourselves, whether through our mouths or our minds, will have an impact. I love the idea of embracing ourselves. Sometimes I do that, literally, and it helps. I also give myself a real pat on the back when I’ve accomplished something challenging–or just gotten through a day of small feats. Thanks for this reminder that loving ourselves makes us stronger and more resilient. Your divine thirst for a meaningful life is truly inspiring. Thanks for the reminder and your words of wisdom.